Come on, have another bite of your sandwich. It’s that type of ham you really like. I asked you if you wanted peas or sweetcorn and you said peas, so eat them please. I want you to have a few more mouthfuls at least….I made pasta and pesto because it’s your favourite. 1.The child controls what the parent serves. 2.The parent then tries to control what goes in the child’s mouth. This is so the norm that it’s easy not to even question it. After all, it seems to make sense: If we give our child the foods they say they like and want, they’re more likely to eat in the first place. And if we then push and encourage them to eat, we’ll get more of the food into them, right? 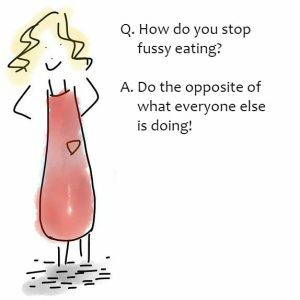 The secret to stopping fussy eating is to do the very opposite. 1.The parent controls what they serve the child. 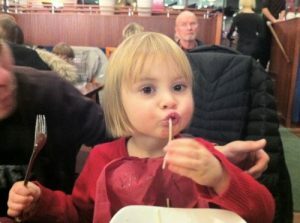 2.The child then controls what goes in their mouth. Or in other words, serve whatever meals and foods you want to. Then leave it entirely up to them to decide whether and how much of it they eat. This can sound really scary – and irrational – at first! They’ll eat next to nothing if I do that! you might think. What’s the point in serving them something I know they don’t like? And why would they eat any of it if I don’t encourage or persuade them to? But it really does make a huge difference. Here’s why. Firstly, it’s about EXPOSURE. A child needs to be exposed to a food on a regular basis to become comfortable and familiar with it – a precursor to actually eating it. When you stay in control of what you serve, you can expose them to a wide variety of meals and foods. If, on the other hand, you let them pick and choose what you serve, they will go for their preferences and favourites and those foods will quickly become their only ‘safe’ foods. Before you know it, you’ll soon be able to count the number of meals they’ll eat on one hand – and still have fingers left over! Secondly, it’s about POWER AND ATTENTION. If you completely stop pushing them to eat what’s on their plate, they have nothing to react against and no attention to gain by not eating something. And if there’s no power or attention available in this way, the most enjoyment to be had is from the food itself. Once the pressure to eat is taken away, their natural curiosity about food and their own desire to eat can emerge. Food is, after all, a pleasure. 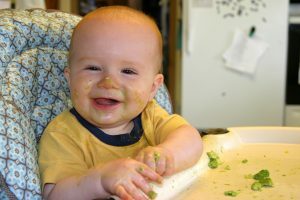 Humans – even little ones – naturally want to explore and eat food. It’s a basic human instinct that we shouldn’t mess with! 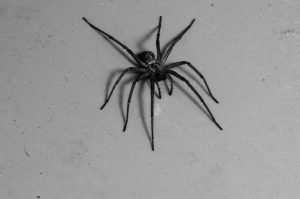 If you like this, you might like What have spiders got to do with fussy eating? Should I use a sticker chart to encourage my child to eat? Sticker charts can seem like a really good idea. You see them everywhere in the shops, after all. They’re colourful, fun, visual…they make things concrete. And children like stickers! A sticker chart says: If you do that, you’ll get this. The child isn’t eating the food because they choose or want to. They’re eating it because they’ll get a sticker. The motivation is all external. If we want a child who is truly a happy, healthy eater, we have to create the conditions that tap into and build their own internal motivation to eat the food. They give your child the message that eating is a chore. Having a sticker chart for doing something tedious or tricky – like learning your times tables – would make sense. But eating food is – or should be – a pleasure! A sticker chart teaches your child that eating is just something you have to endure to get something good. They’re just another way of putting pressure on your child to eat. …which, if you’ve read Getting the Little Blighters to Eat, you’ll know means you’re in for trouble! 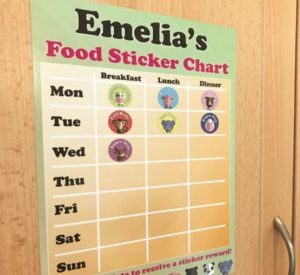 A sticker chart tells your child loud and clear that you really care what they do and don’t eat, simply giving them more to resist and react against in the long term. Sticker charts for eating…stick em’ in the bin! Note: A paediatric dietitian will sometimes use a sticker chart in a very specialised way with a child around eating behaviour, rather than directly for eating. This is different to the general use of sticker charts by parents for eating, which is the focus of this article. Why does my child eat better at nursery than at home? 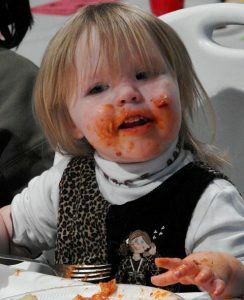 Quite a lot of parents tell me that their child eats meals and foods happily at nursery that they won’t touch at home. They are puzzled – and frustrated! What’s the reason? 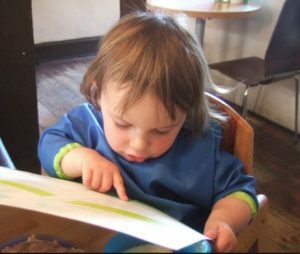 It’s all about the dynamic between adult and child.Whilst the nursery staff want the children to eat well, there isn’t that same intense parent-child dynamic at the table where your child can tell that you really (really!) care what and how much they eat. 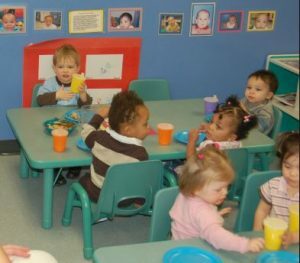 Also, there are a lot more children per adult at nursery, so inevitably less focus and pressure on each individual child to eat their food. This means that at nursery, your child has a lot less attention and power to gain by NOT eating something. So those raw carrot sticks that they ignore at home, or that cottage pie that they push away sulkily when they’re with you, suddenly become rather appealing when they’re hungry anyway. If you’ve got a fussy eater, eating out at a restaurant or café can be something you dread or avoid. “What’s the point?” you might think. “It’s easier to stay at home and feed them something I know they’ll eat.” Here are some good habits to get into that will help make eating out as a family a more positive experience for everyone! 1. Don’t issue any warnings before you go. Avoid saying things like “I want you to be good at the restaurant today” or “Promise me you’ll eat your meal this time”. Kids live up to expectations. If you show them you expect trouble, you’re more likely to get it! 2. Let them have their own menu to look at. It makes them feel grown-up and involved, whether they can read yet or not. Also, encourage them to tell the waiter or waitress their order themselves once they can talk! 3. Don’t order tiny ones their own meal. With under-twos (or up to four years old, depending on the appetite of your child! ), the best thing to do is ask for an extra plate and give them bits and pieces from your own meals. This introduces them to a wide variety of food – and saves money and waste! It may mean they end up with half roast dinner, half mushroom risotto and a bit of cucumber and tomato, but little children don’t know or care about the ‘rules’ of what is and isn’t normally served together. 4. Ask the restaurant if they will do half portions of the adult meals. Many restaurants and cafes will, even if they don’t say so on their menu. 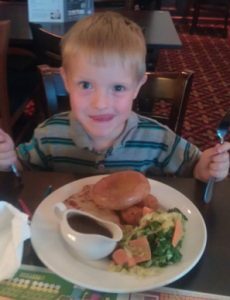 This opens out the choice a whole lot further than the (often very limited and ‘beige’) children’s menu – and doesn’t put the idea in their head that children can’t or shouldn’t eat the same food as adults! 5. Let them choose freely. Don’t deliberately steer them towards a ‘safe bet’ like chicken nuggets or spag bol – or whatever you think they’re most likely to eat. If we want them to be adventurous and open-minded about food, we mustn’t impose limits! This may sound scary (“There’s no way they’re going to eat prawn linguine in a garlic and white wine sauce!” you might think) but when you give them the freedom and responsibility to choose what they fancy, it creates a kind of unspoken contract: I chose it, so I’m going to eat it. 6. Don’t make any judgement about what they choose. Don’t undo the effect of letting them choose freely by saying things like “Fish and chips – are you sure? You don’t really like fish” or “But you didn’t eat the lasagne last time”. Keep those thoughts to yourself! Again, if you give them negative expectations to live up to, they’re likely to prove you right! Show trust in their choice instead. 7. Make it as much about togetherness as eating. Talk together or play speaking games (“Guess which starter/dessert I’d choose off the menu” is a good one for older children!). If you are meeting friends and you know there’s going to be lots of adult chat, then take along pens and paper or activities to occupy them. If the food takes an unexpectedly long time to arrive, don’t expect them to have the patience of an adult. Find a way to engage them. 8. Don’t overly worry about what other people think. Cut them a little slack when it comes to table manners. Let them enjoy their food in their own way. The customers at the other tables would rather see happy children with food on their face and bits falling on the floor than hear them being nagged to eat like an adult. 9. 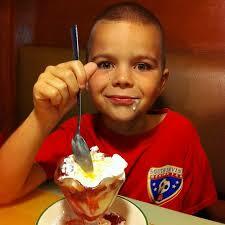 Remember that children’s meal portions vary hugely. I’ve seen kids’ meals that would have left a mouse hungry – and kids’ meals that would have satisfied Henry VIII! Don’t judge how much they’ve eaten by the amount left on their plate. Let their appetite dictate how much they eat. 10. Don’t order dessert until after the main course is over. What have spiders got to do with fussy eating?! Step 1: She looks at pictures of spiders. Step 2: She watches videos of spiders scuttling along. Step 3: She goes into a room with a spider on the far side of it. Step 4: She inches closer and closer to the spider. Step 5: She reaches out and touches the spider wearing a glove. Step 6: Finally, she holds the spider in her bare hands – without feeling any fear at all! She is cured! What was the secret? EXPOSURE! She needed to be put in closer and closer proximity with the very thing she didn’t want to go anywhere near. 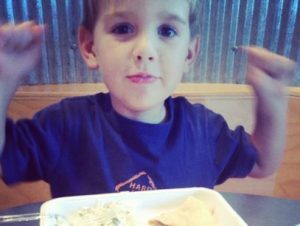 A huge part of turning a fussy eater into a non-fussy eater is also about exposure. 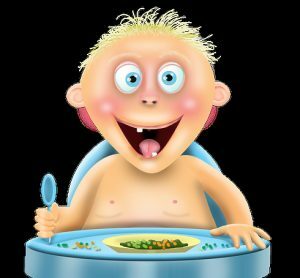 It’s not that the fussy child is scared of the foods they won’t eat (though some children can develop a phobia or have an instinctive aversion to certain foods) but they are likely to have built up lots of negative associations with those foods through being repeatedly pressurised to eat them. On top of this, when a child becomes fussy, we often stop giving them the foods they don’t eat – or any new foods – because we think it’s a waste of time and effort and they’ll end up in the bin anyway. Those foods then become alien and unfamiliar to them. The first step is to re-expose them to those foods so they can become familiar and feel comfortable around them. They need to be put into close proximity with them! And just like the spider therapy, I often advise parents – especially those with extremely fussy eaters – to do this gradually over a few weeks. Step 1: Present a tiny amount of the food they stopped eating – or a new food you’d like to introduce them to – in a ramekin or dipping-sauce bowl to the side of their meal. Step 2: Put the food into a section of a divided plate with the rest of the meal in the other sections. Step 3: Put the food onto a normal plate with the rest of the meal. Initially, your child may ask for the food to be taken away, push it away or throw it on the floor, but if you calmly say, “It’s okay, it’s up to you if you eat it or not” they will soon allow it to ‘to exist’ in their presence. If they throw the food on the floor, don’t tell them off. In fact, ignore that behaviour completely and wait until mealtime is over to clear it up so it seems as if you’re really not bothered. It’ll soon stop if they get no attention for it whatsoever. 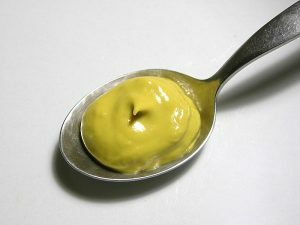 There should never be any pressure at all to actually eat the foods (Remember the golden rule: DISH UP, SHUT UP!). And once a food has been introduced, make sure it makes a regular appearance from then on to keep it familiar. ‘But how does this exposure lead to them actually eating the food?’ you may be wondering. 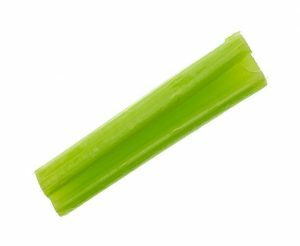 Read this real life success story Lessons from a stick of celery to find out!